This article briefly explains the various options presented within the InstantKB Agent Control Panel. This may be helpful if your new to InstantKB and want to get familiar with the Agent CP web interface. The arrow icon allows you to collapse and expand the navigation shown along the left within the InstantKB Staff CP. Some lesser used options can only be found within the expanded navigation. The navigation on the left within the InstantKB Agent Control Panel shows all the tabs you have defined via the InstantKB Administrator Control Panel. To learn more about tabs and creating custom tabs within InstantKB please see "Custom Tab Overview" and "Controlling Access To Tabs". Quickly create new articles or support tickets within the tabs you have permission to access. For example if you wanted to send a customer a support ticket you would click this link, click Add Ticket and type in the customers username. See at a glance if any new comments submitted by visitors for articles require approval or manage all existing comments submitted for articles. You can completely disable comments within articles if they are not needed via Member Permissions within the Admin Control Panel. Search across all the articles & tickets within all the tabs you have access to in real-time as you type keywords. Click a result to jump to the specific article or ticket in edit mode. Jump back to the InstantKB front-end support portal that is shown to your customers. 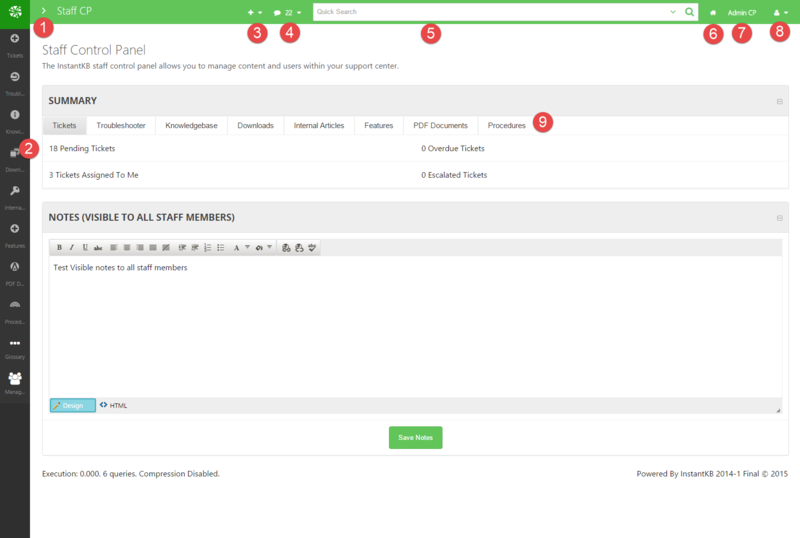 If the account you are logged in with also belong to an "Administrator" member group within InstantKB you'll have access to the InstantKB Administrator Control Panel via this link. Manage your personal user profile and general account settings. Shows general statistics for all of the tabs you have access to via the InstantKB Agent CP. Article has been viewed 7.1K times. Need direct assistance from InstantASP developers. Submit a support request. Talk with InstantASP and other IstantASP customers in our public forums. Escalate, close or reply to your existing private support requests.